Nginx is a robust and fast reverse proxy. Haproxy is a fast application load balancer. Together can be used for publishing to internet web services in security way. For this reason this article has the objective to explain how to secure web services using nginx and haproxy. The haproxy, in addition to application load balancer functionality, has a native language to work better with http header rewrite and moreover it implements the sticky session functionality present only in nginx commercial product. Using nginx and haproxy is possible to manage too a warning web page useful during maintenance activity. This is the scenario involved in the article. The linux distribution used is Centos 7.2. The apache with php are running in two docker containers (ubuntu based, see https://medium.com/dev-tricks/apache-and-php-on-docker-44faef716150#.l1r622qav) for avoiding to create two virtual linux systems. The laburatory implemented can be tested at the following url https://nikto.sysandnetsecurity.com/index.php. The haproxy gui is reachable at https://nikto.sysandnetsecurity.com/proxy/. The user account is admin, the password is stegri. Let’s start with nginx and naproxy security configuration. After installing nginx, a new virtual server called nikto.sysandnetsecurity.com is configured for forwarding all the interested uri to haproxy that is configured for balancing all the traffic to two apache back end servers. It’s best practice to intercept the back end errors returning to client a standard error. This solution is more elegant and avoid to make known to internet important info about software used. Le’t go to configure the virtual server for proxying the http request to haproxy. It’s good practice to separate internal from external traffic for applying, for example, different balancing policy, or for closing the site to internet only. proxy_set_header Host $host: The Host Header is proxied as received from client. proxy_set_header X-Real-IP: The remote ip is useful for troubleshooting and for monitoring. proxy_set_header X-Forwarded-For: Useful for the same reasons. Before passing to haproxy configuration, new http security headers can be returned to client. For more information about these new headers see http://www.securityandit.com/security/penetration-testing/. For managing a warning_page to publish for maintenance activity, a equal virtual server in listening on port 88 is created and contacted by haproxy when the all the active servers in the balancing pool are down or in maintenance state. Don’t forget to have in /usr/share/nginx/html two html pages: error and warning page. The default access log can be used for monitoring the attack attempts and for example for categorize them in a gui environment by kibana (see http://www.securityandit.com/security/ids-with-pfsense-suricata-and-kibana/). Let’s go now now to configure haproxy. After installing haproxy, two new balancing pools must be created: the first, in listening on 7001 port, for internet access; the other, in listening on 7002 port, for internal access. For forcing the cookie to be used only in https session and not in java script the “HttpOnly; Secure” field is added in the cookie’s end. The balancing pool has a third application server in backup state called warning : it is actived when the first two application servers are down or in maintenance state. The stick session is performed putting in the head of cookie app01~ or app02~. These prepend strings are sent to client but not to to back-end servers. The process is trasparent for them. Following some test to demonstrate how the service is balanced to two back end servers. You can test directly using https://nikto.sysandnetsecurity.com/index.php. After putting in maintanance mode the two application server by haproxy gui https://nikto.sysandnetsecurity.com/haproxy (admin/stegri), the warning redirect page is returned. 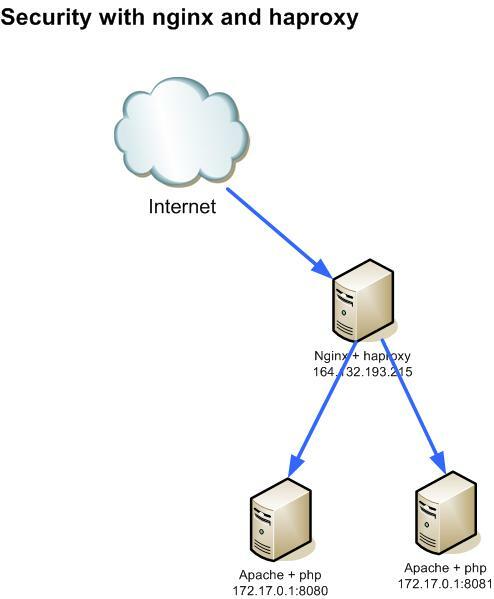 Nginx and haproxy permit to configure a secure and scalable reverse proxying system. High availability is given using keepalived as explained in http://www.securityandit.com/system-and-network/nginx-haproxy-and-keepalived/. It’s also possible to have more WAN internet provider with nginx and haproxy that balance to back end servers. The internet traffic can be balanced by DNS. Very scalable architecture. Don’t hesitate to contact me for any suggestion or problem.